Luscious whiffs and dense smokes of Shisha commute freely in Dubai; however the city is fairly conservative for public smoking of cigarettes and other substance exploitation’s. Presently, young individuals are increasingly vaping instead of smoking. Electronic Cigarette and Vapes are progressively sold as they basically utilizes Vegetable Glycerin (Propylene Glycol) based liquescent blended with little amount of food grade flavors and nicotine. This mixture is vaporized to produce dense flavored smoke. Since Dubai is a gigantic market, it has a plenty of store and shops that offers the finest quality of Vapes and Electronic Cigarettes and their accessories too. Have you quitted smoking? Is smoking only a style statement for you? Do you prefer Vaping over Smoking? If the answer to these questions are positive then don’t miss to find the best variety of Vapes and Electronic Cigarettes in Dubai. If you want to buy one captivating Electronic Cigarette and its accessories to take along with you, for your personal use or may be to gift your associates; then, here are some of the famous smoke shops in Dubai that will surely arouse your fascination for a luscious vaporized smoke. Smokers’ center is the most famous store to buy all types of smoking accessories. Here, you may find a wide array of over 3000 brands of cigarettes, cigars, vapes and their supplementary accessories. You may find here a great collection of electronic cigarettes and vapes with complete accessories including filters, foils, adapters, covers and holders. Smokers’ center is situated in Ibn Battuta Mall, The Dubai Mall, Midrif City Center and Burjuman Centre. To explore an inclusive variety of multi-brand selection of smoking accessories, Mohammad Mohammadi Smoking Store is idyllic. It offers a great assortment and quality at great value. You may choose from a wide collection of local and international brand, and can also ask them to assemble one as per your needs. Mohammad Mohammadi Smoking Accessories is located on Al Badia Boulevard Dubai. This store has one of the finest brand collection of vapes and electronic cigarettes in Dubai. It is also a multi-brand store, however they also sell their personal brand which is also of very good quality and affordable. Here, you may find different qualities of liquescents, food flavors and nicotine fill too. This store is situated beside the Capitol Hotel, on Al Meena road, Bur Dubai. Murdef Start Smoking Centre is specifically famous for medwakhs, dokha and other types of flavors that are used in smoking accessories. This store is specifically recommended to buy good quality fills as it carries a wide variety of electronic cigarettes liquescents. The store is placed near Midrif City Centre. The smoking section of Carrefour’s Hypermarket is quite suitable to buy affordable smoking accessories including, cigarettes, cigars and Shisha. If you opt to buy some vapes for your friends to encourage them quitting smoking and start vaping; then Carrefour’s is the right place to buy your sets of vapes and electronic cigarettes in Dubai. Carrefour’s Hypermarket is placed within the Great Mall of Emirates. 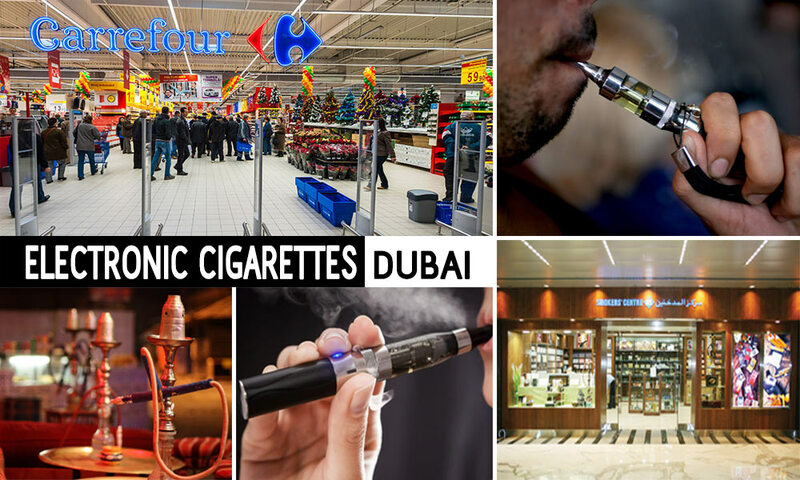 These are some of the recommended places to buy electronic cigarettes in Dubai. If you’re interested in buying Shisha and it’s accessories, you can also checkout the best shops to buy Shisha in Dubai. To recommend a place to buy electronic cigarettes in Dubai, please add comments below. You can only get them online or in Dragon Mart 1. But price is high actually. you can get them in FB online stores. You cannot buy a vape from Carrefour.